Your brain controls who you are—how you think, feel, and act. As you age, it's not uncommon to want to remain as sharp and "with it" as you were in your younger years. Whether you want to hone your memory, manage stress and anxiety, or simply eat brain-healthy food, Staying Sharp For Dummies shows you how to keep your mind sharp, agile, and creative well into your golden years. Research shows anyone can improve brain performance—and it's never too late to make changes to achieve your optimal brain health. While brain exercises certainly help, it's also vital to promote healthier living as a holistic way to support brain health. 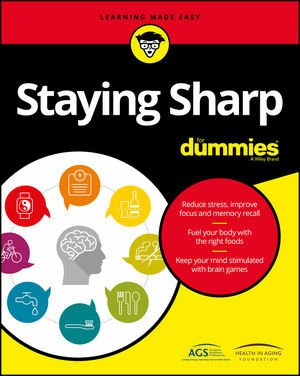 Staying Sharp For Dummies explains how keeping physically fit, eating right, managing stress, and even connecting with others helps give your brain the boost it needs to stay sharp—well into your golden years. If you or a loved one are looking for authoritative, accessible guidance on staying sharp, this essential guide endorsed by the American Geriatric Society and the American Geriatric Society Health in Aging Foundation covers the gamut of lifestyle and activity changes that can maximize brain function and health. The Health in Aging Foundation is a national non-profit organization established in 1999 by AGS to bring the knowledge and expertise of geriatrics healthcare professionals to the public.